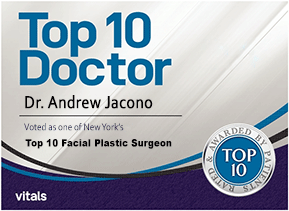 Neck Liposuction Top NYC Facial Plastic Surgeon Dr Andrew Jacono specializes in face & neck lifting procedures. Excess fatty deposits in the chin, neck and cheeks may give the appearance of being overweight, or make the neck look like it hangs or cheeks look like they droop. This unwanted fat may be gently removed by various mini procedures with very small incisions placed in hidden locations that have essentially no downtime. A poorly defined facial structure can be improved with Neck Liposuction or a Buccal Fat Removal. Submental or Neck Liposuction removes excess fatty tissue to help further define the chin and the neckline. This is often referred to as double chin surgery. Full rounded cheeks can be reduced and cheek bones can be better defined by performing a Buccal Fat Removal. Neck liposuction is performed by using a very small tube inserted under the skin and gently removes the excess fatty tissues of the neck with a vacuum. The neck contour is improved in two ways: volume reduction and tissue tightening. After the fat has been removed, a few days of compression (pressure) dressings allows the skin to ‘shrink’ and redrape to the new contour of the neck. 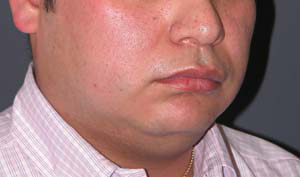 Neck Liposuction Patient 1: This man complained of a double chin and wanted surgery. He underwent a submental neck liposuction to contour his jawline and create a more defined neck. 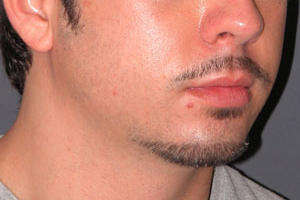 A chin augmentation was performed at the same time because he had a retrusive weak chin. The healing process that occurs under the skin following neck liposuction assists in tightening of the skin and underlying tissues. This can help tighten the neck without a neck lift surgery. If the skin does not have enough elasticity to contract back, skin tightening with a neck lift will be required. If liposuction is done on a neck that has no skin elasticity, the skin will hang after the liposuction. 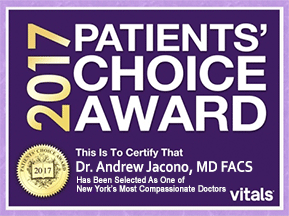 Doctor Jacono can determine if you are a good candidate for liposuction alone. Neck Liposuction Patient 2: This woman came in desiring a tighter neck and jawline and assumed she needs a face and neck lift. She underwent only a submental neck liposuction and the removal of fat and the natural skin shrinking gave her a tighter neckline without a lift. Buccal fat pad removal is for those with extra round cheeks who wish to have a slightly more chiseled look. Most people lose this roundness in their late 20s. Due to heredity, some people may never lose the chubby look in their cheeks. Often candidates for buccal fat pad extraction refer to their face as having “chipmunk cheeks. Buccal fat removal, also called cheek reduction surgery, offers a solution to those who want to reduce the size of their cheeks. Removal of these fat pads can slim the cheeks and contour the face. This can help people achieve a more chiseled look. Neck Liposuction and Buccal Fat Removal Patient 3: This man came wanting to get rid of his “chubby” cheeks. 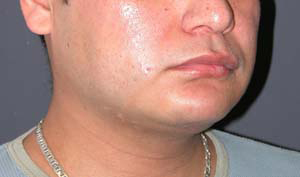 He underwent a buccal fat extraction to remove the extra fullness in his lower cheeks, and a chin augmentation and neck liposuction were also performed to create a more masculine defined jawline. Prior to surgery all patients receive a complete physical examination and are started on vitamin supplementation and homeopathic therapies to enhance healing after surgery. 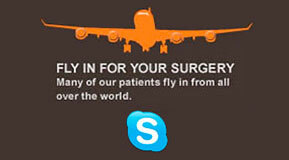 Research has shown that surgical results are improved when these regimens are part of your surgical treatment. Neck Liposuction Patient 4: This young lady was unhappy with the excess fat underneath her chin and neck region. She underwent a submental neck liposuction to remove the fatty tissue and to contour her neck and jawline. Neck Liposuction Patient 5: This female patient wanted to reduce the appearance of the fat that was located underneath her chin region. Dr. Jacono performed a submental neck liposuction to reduce the excess fat and to give her a sleeker and more contoured jawline. 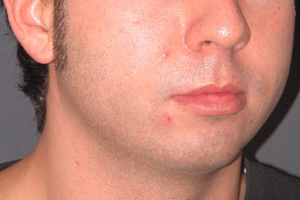 Neck Liposuction Patient 6: This male patient in his forties wanted to reduce the fat under his chin and neck region. Dr. Jacono performed a submental neck liposuction in order to reduce the submental fat and to create a chiseled chin and jawline. 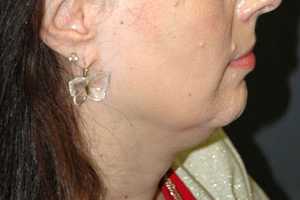 Neck Liposuction Patient 7: This young lady wanted to have a slimmer neckline. She underwent a submental neck liposuction which reduced the appearance of the submental fat and the results are a slimmer and more youthful looking neck. 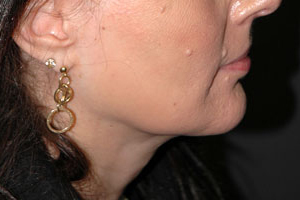 Neck Liposuction Patient 8: This young lady wanted a more sculpted chin and jawline. Dr. Jacono performed a neck liposuction procedure to remove the submental fat and give the patient a gorgeous neck and jawline.